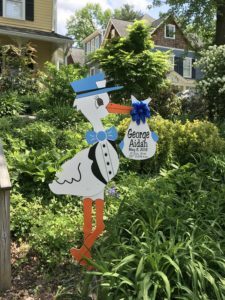 Flying Storks has the cutest storks in all of Loudoun County VA.
We have a special Yard Stork Sign Birth Announcement to deliver to a Sterling Virginia newborn. Consider sending a Personalized Stork Yard Sign Birth Announcement Today! $99 includes, delivery, pick up, and all Stork Bundle Keepsake customization. Please contact us at (301) 606-3091 to rent or reserve a yard stork sign birth announcement. Each 6-foot stork lawn sign is personalized with the baby’s delivery information on a special keepsake bundle that parents will treasure forever. Our stork announcement signs are a perfect way for your friends or family to announce their new bundle of joy!